I FINALLY was able to have brunch at Mother's Bistro! It only took three tries! We had reservations for 10:00am. When we arrived, the wait without reservations was 1.5-2 hours. For brunch. In Portland. Where there are brunch places on every corner. Check out this crowd.I could barely get through the throngs of people INSIDE the restaurant waiting for a table. It was crazy. While we were waiting for our table we learned from many people waiting for a table that they were tourists from out of town and that the concierge at their hotel had sent them to Mother's. In fact, almost everyone I met was from out of town and had been told that Mother's was THE place for brunch. No wonder there's always such a line on Sundays! I hope the local hotels are getting at least a plate of bacon for sending so much business to Mother's. 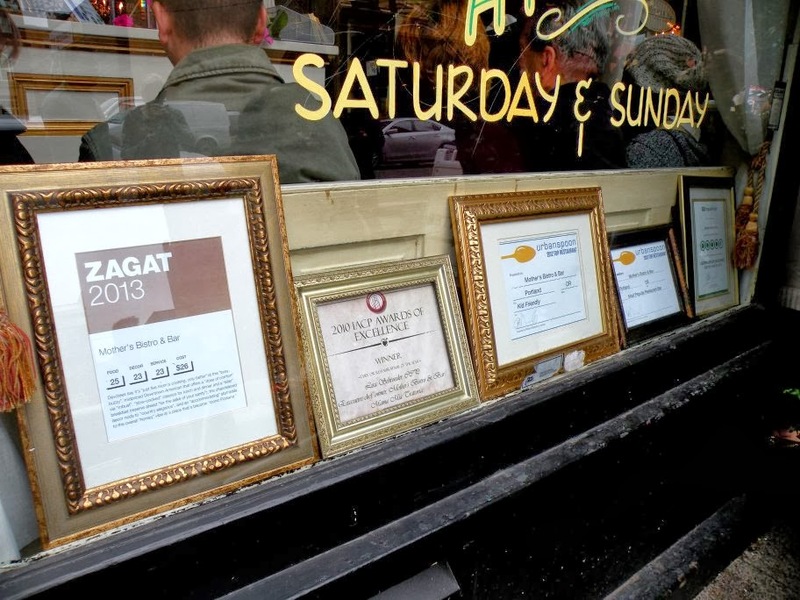 At least there's something to read while waiting for a table, Mother's has a nice sampling of Zagat rating and multiple awards in the window. Those people you see in the window? They're waiting for a table. It only took about 15 minutes to be seated - which was impressive considering the crowd. I would much rather wait 15 minutes with a reservation than 2 hours without. In order to fit an optimum amount of diners in the restaurant there's a bit of a strange shuffling of tables that occurs after you sit down. Once I was seated in a window booth, the waitress asked me to move my feet and proceeded to push the table as far as it would go towards me, so that the base of the table was against the window seat, which meant I couldn't rest my feet on the floor, but had to rest them on the base of the table. It was very awkward and meant I was pretty much trapped while I was dining, but it wasn't awful. Just... a unique experience. 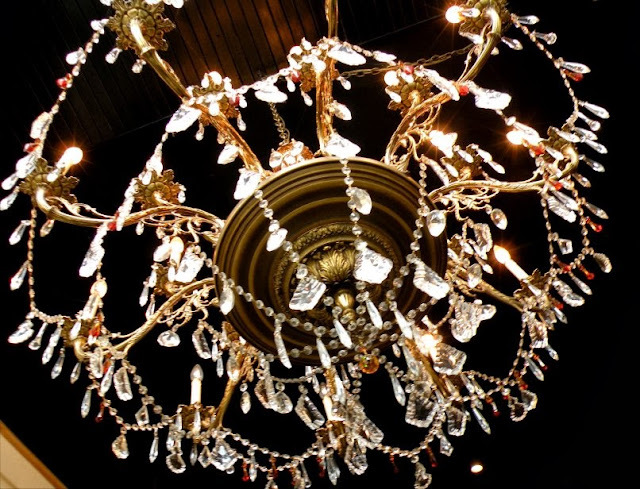 The dining room is full of pretty chandeliers. Our server was excellent, which was a refreshing change. 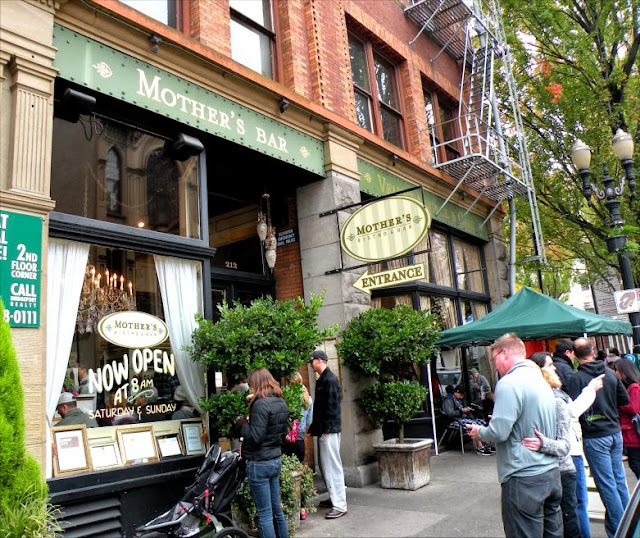 Portland is full of excellent food and sub-par service, so much so that it seems like being rude is a requirement to work at many restaurants but not at Mother's! Our waitress was sweet and helpful, and had a sense of humor to boot. As usual, T ordered a bloody Mary, in this case it was Mother's Famous Bloody Mary, made with house infused pepper and jalapeno vodka. It was okay. But lacked the "oomph" that I love about the bloody Marys at Irving St Kitchen. T, true to his normal brunch taste, ordered the sweetest thing on the menu. In this case it was the local peach waffle. T LOVED this waffle. 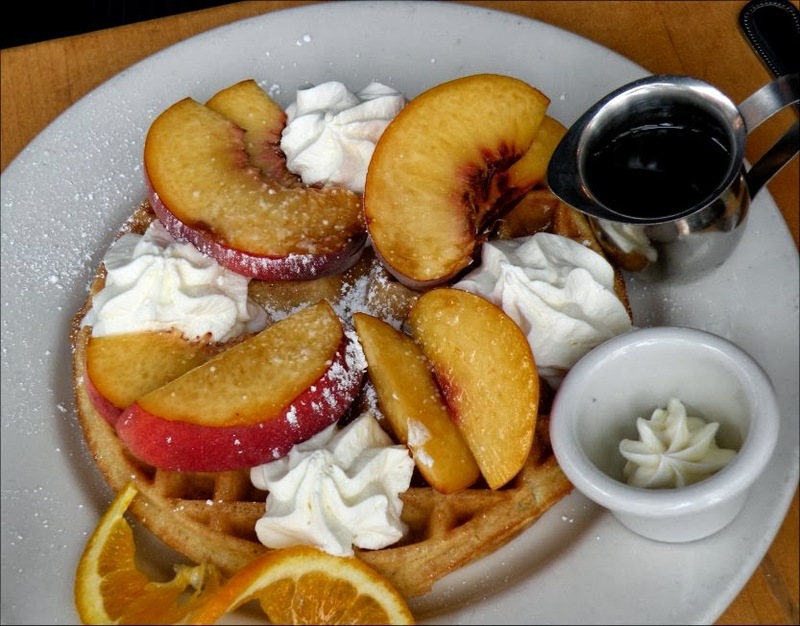 What better for someone who loves dessert for breakfast than a Belgian waffle with local peaches, whipped cream and maple syrup? 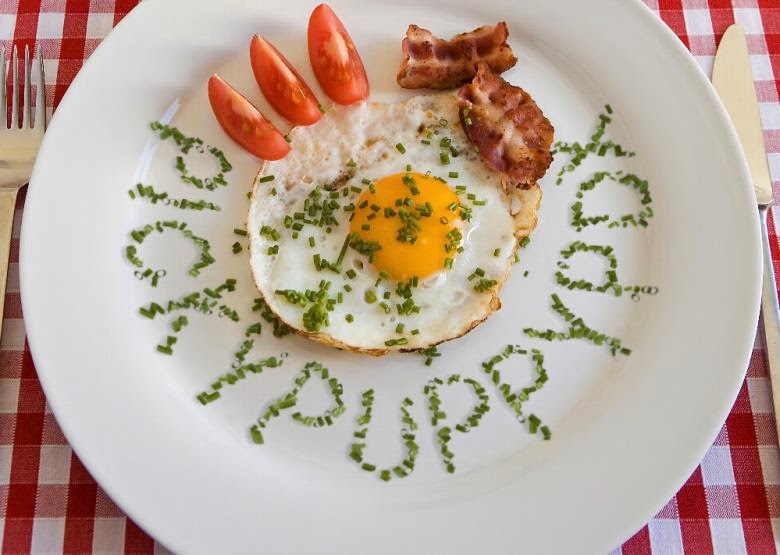 He also added a plate of bacon. 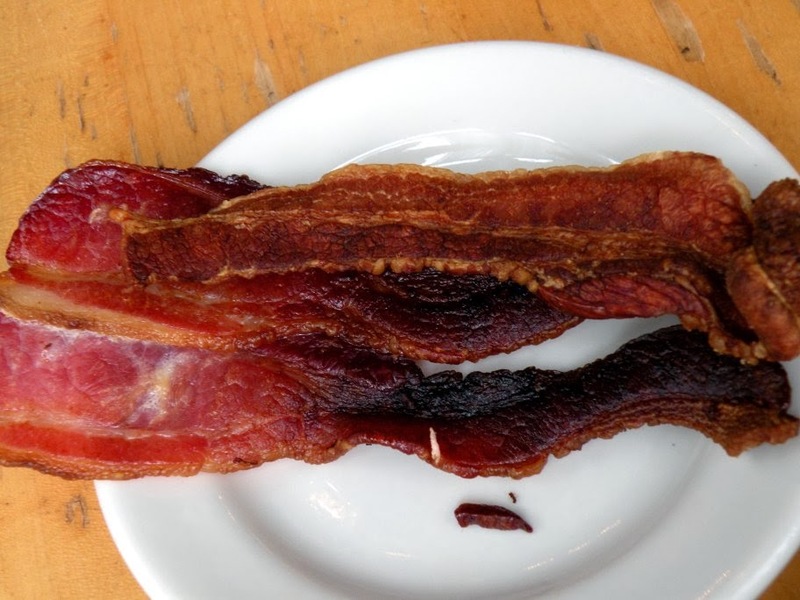 Because this is Portland, and no breakfast would be complete without some kind of pork. The bacon was thick cut and excellent. See that tiny scrap at the bottom of the photo? That's the piece I tried - and after trying it I wanted to order 300 more plates of bacon. To date this is my favorite bacon in Portland. 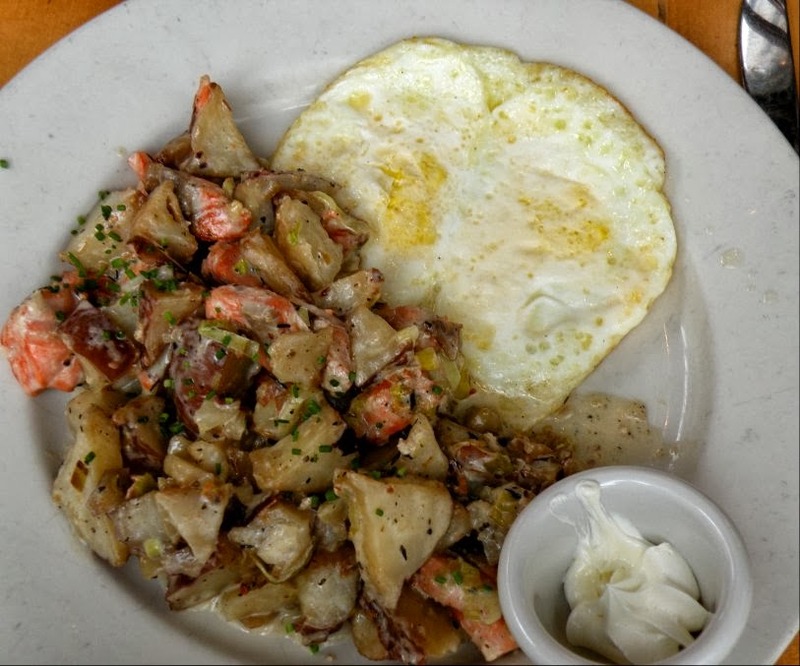 I ordered the salmon hash, as almost every review I read on Mother's, and every tip on Foursquare, recommended it. The Wild Salmon Hash, with leeks, potatoes and a touch of cream was okay, but it lacked any flavor beyond the salmon, it was kind of bland. I ended up eating the salmon out of it and leaving the potatoes. My eggs were delicious and cooked well. Mother's was good, and with reservations it was definitely worth a 15 minute wait, but I don't think my meal was worth waiting an hour and a half to two hours for (wait time without reservations). I would definitely like to return for lunch or dinner as I feel like it would be much more enjoyable if it weren't quite so packed. 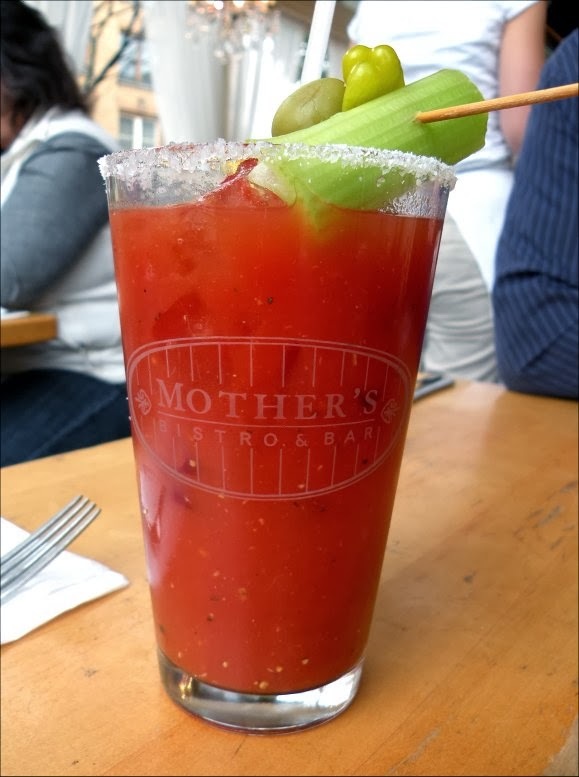 We had - Mother's Famous Bloody Mary - $8.00, Local Peach Belgian Waffle - $6.95, Honey-Cured Bacon - $3.95, Wild Salmon Hash - $12.95. 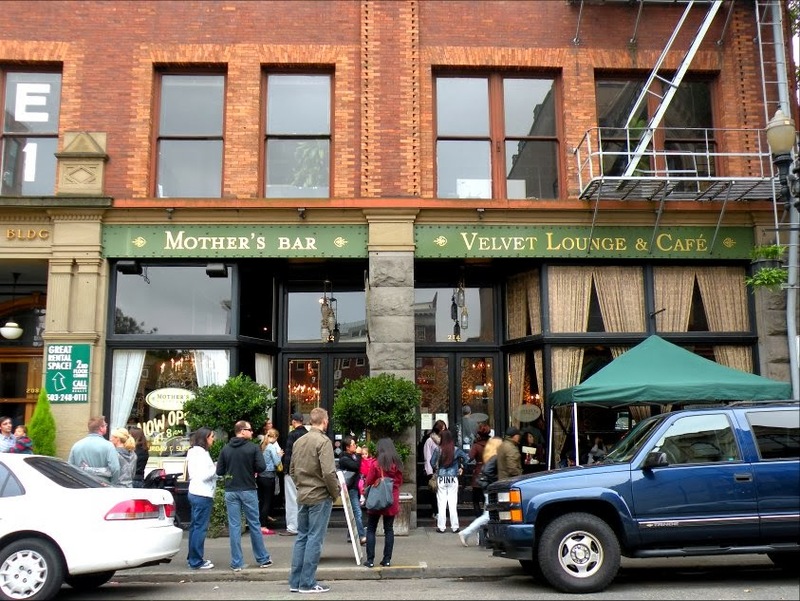 You can check out Mother's Bistro for yourself at www.mothersbistro.com, they're located at 212 SW Stark Street in Portland and serve brunch from 7:00am - 2:30pm Tuesday - Friday, and 8:00am - 2:30pm Saturday and Sunday. They serve lunch Tuesday - Friday from 11:30am - 2:30pm. Happy Hour is 3:00pm - 7:00pm Tuesday - Friday. Dinner is served 5:30pm - 9:00pm Tuesday - Thursday, and 5:00pm - 10:00pm Friday and Saturday.